Anthony Milford wants the ball in his hands more often. That was the Brisbane playmaker's blunt request as the Broncos prepare to take down North Queensland's monster pack at Suncorp Stadium on Friday. 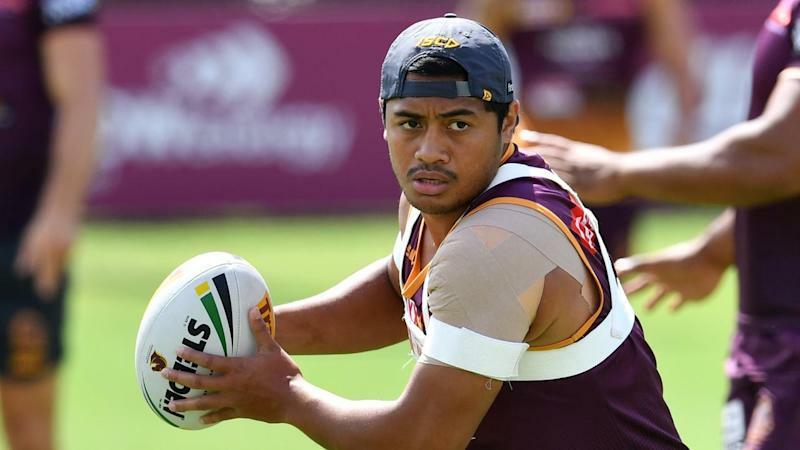 Milford missed Brisbane's pre-season games and says his combination with halfback Kodi Nikorima should continue to gather steam after a tough season-opening loss to Melbourne. The five-eighth said he was pleased new coach Anthony Seibold has encouraged an offensive system that should give the halves more early ball. Buoyed that the video review of the Storm clash revealed an encouraging defensive effort, Milford said it also reinforced what they needed to do more of in attack. "It's no secret that Kodi and I, our strength is our running game," Milford said. "The more times we're running, injecting, the better we are. "I enjoy ... getting the ball in my hands early and making the decisions myself." Brisbane will still need their undermanned pack to step up against the Cowboys, who boast the formidable Jason Taumalolo and run deep enough to play former Bronco and Kangaroo Josh McGuire off the bench. Milford said the Broncos would do their best to tire Taumalolo after he ran for 301 metres last weekend, but the forwards wouldn't do all the work. Centre James Roberts (back), meanwhile, completed a full training session on Wednesday but is far from certain to return on Friday. If he isn't cleared Kotoni Staggs, who replaced Roberts early in the loss to Melbourne, again shapes as the man to replace him in what will be his first Queensland NRL derby. Recent clashes between the sides have not disappointed, with eight of the past nine decided by six points or less and four of the last eight decided in golden point extra time. There is no Johnathan Thurston for the Cowboys this season, but with McGuire, and former Broncos winger Jordan Kahu wearing the North Queensland No.1, there is plenty to be excited about. "It's the Queensland derby, it's a great game and honestly great to be a part of," Brisbane's Corey Oates said, adding that only a grand final could rival the occasion. "It's been that close every time, great to be a part of the game, fast, competitive, clean."